Most text of the present article comes from the review published in the twenty first issue of the British C64 magazine ZZAP!64 (street date: December 10th, 1986). RL have taken their latest game to the board of film censors, resulting in a classification restricting sale of the game to people aged fifteen years and older. As the game is based on a classic horror story, this will no doubt be considered good publicity by Clem Chambers' outfit, but it is publicity at a price. Not only is the certificate binding by law (theoretically limiting sales), but the censors are used to dealing with film makers with plenty of ready cash. The process is disproportionately expensive for a software house. So does the game really deserve its rating? No. Is it good regardless? Hmmm, well . . . no. The thing is, this is a classic case of a game depending on its marketing and license to help it sell. The game itself isn't bad -- just average. It's well presented and reasonably well written, but stands as much chance of scaring a five year old as a DC10 has of flying. None at all. Actually, the morbid ones among you who have a taste for the macabre and gothic horror will probably find the game interesting. Actually using the format of a computer adventure to recreate a scary and mysterious atmosphere is rather more difficult than it sounds, because of the heavily punctuated nature of play whilst problems are worked out. Sustaining that feeling of uneasiness has been the aim of a few adventure writers in the past, but never has it really succeeded. Unfortunately, it doesn't in this game. But what you're left with is a surprisingly valuable curio that's graced with above average graphics. The game is well packaged, with shadowy artwork and blood coloured text covering the front of a large format box. The cassette version is in three parts spread across two tapes. The package is otherwise sparse, with all the instructions sitting comfortably on the backside of the inlay. Of course, wherever you look the censorship label screams out at you. 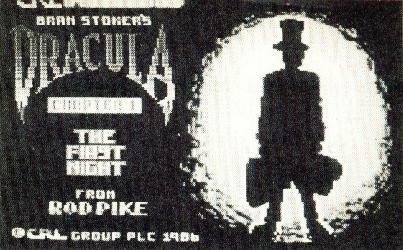 Part one of the game is called The First Night and concerns the young English solicitor who travels to castle Dracula to settle the final arrangements for his client's purchase of a house in England. You play the part of the solicitor. During your travels a last stop is made at the Golden Krone Hotel, only to find that the locals are strangely obsessed with something . . . The nightmare sequences are especially effective in this early part of the game, but there's little to do except try different types of cuisine each time you play. Arrival, apart from being the title of an embarrassingly bad Abba album, is also the title of the second part of the game. Again you play our solicitor friend. And Dracula comes into the story proper. This is actually quite well written. Soon after you arrive and talk with the count, it becomes obvious that you are not going to be allowed to escape (but you knew that really, didn't you). Getting a letter back to England is your only hope. Finally, in The Hunt, you play the part of Doctor Seward, a psychiatrist who runs a home for the insane. You become the recipient of the letter sent from Castle Dracula and decide to find out what's going on. Matters are complicated somewhat by the untimely disappearance of Renfield, a normally docile character who has escaped and is even now being warped and twisted under the evil influences of the Prince of Darkness . . .
Well, most people have a fairly good idea of the story and the game does well to adhere closely to the plot whilst still allowing the player to make major decisions. Experimentation soon reveals, however, that there is comparatively little freedom of play and the few puzzles (that I've encountered) are very easy to solve. The on-screen presentation is very good (though some of the text flickers due to a bad scroll routine), but play is still fundamentally limited by a parser that only accepts two-word input and suffers from a small vocabulary. The redefined text, blood red, American Uncial and all, does little to hide what seems to be an out of date Quilled effort trying desperately to be something better . . . An interesting version of the story but not one worth shelling out this much for. During testing this game, I wrote a walkthrough that lets you see the graphics of all endings/kills. Visit the above sites to find it!